Me in my silky Metamorphic-- first time I sewed a slippery fabric and taffeta together. 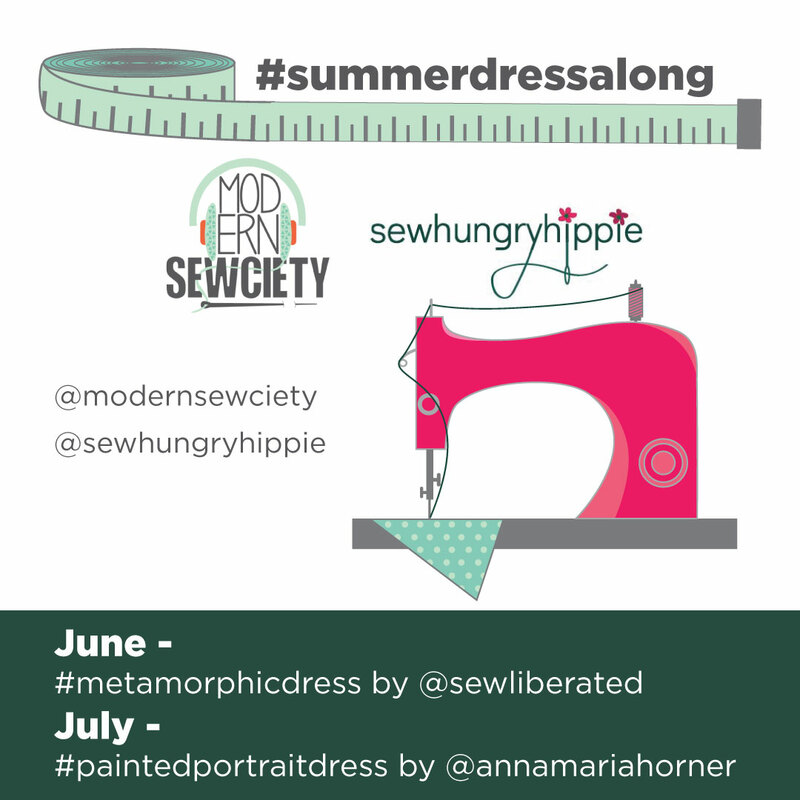 June 1 begins the Sew-A-Long for the Metamorphic Dress! That's less than two weeks away--can you believe it? 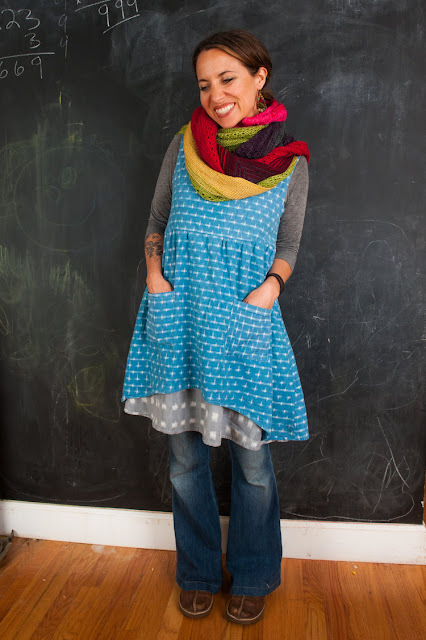 Stephanie of Modern Sewsciety is my partner on this one-- she's my Podcast FAVE. I often pop a podcast on while sewing because it feels like I have friends in the room with me--nearly anyway! ***NOTE----I am a D cup and I wear this without a problem. If you're larger than a D I'd say size up one level. Here's Meg (designer) of Sew Liberated in her Metamorphic, layered over jeans. GENIUS! June 1 Week one: Discussion of sizing, cutting out pattern, and beginning steps of sewing. June 22 Week four: Side seams, hem, finishing up. Talk about layering / styling ideas. Wrap up. I have made Metamorphic in linen, silky poly blends, taffeta, and chambray all with good success. I made one in modal that didn't turn out so well. The modal dress was pulling too much on the shoulder seams--where a lot of the weight sits. Keep this in mind when picking fabric. I highly rec silk noil. It's a lot like cotton in texture, slubbier, and NOT silky/slippery. You can get it here in many colors. Stonemountain and Daughter stock kits in sand washed rayon as well. 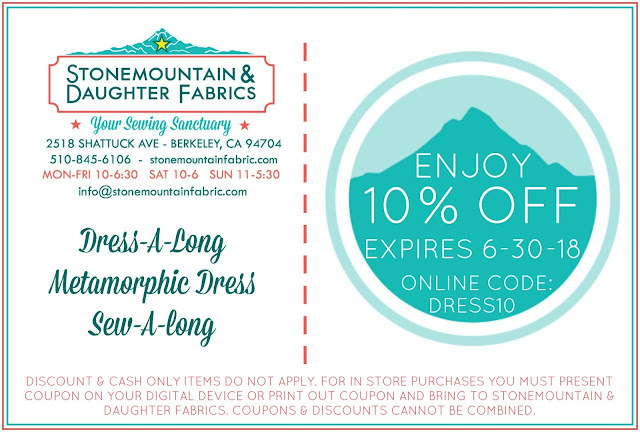 Stonemountain and Daughter are graciously providing a discount to our participants - use the code below at checkout to save some cash. Video will be uploaded for each step, so don't worry if written word isn't your thing. I'll have photos too-- it's our goal to make this as simple as possible for you to follow along. Weekly posts feel less intense, in my opinion. No need to "check in" daily or anything. We will do our best to answer you. If we don't know the answer, we will try to find out for you. please note this dress does not have closures, so there won't be extensive fitting issues to deal with. I am not a trained seamstress but self taught. Keep this in mind, as I won't be able to tell you how to adjust it into a jumpsuit with four zippers and inset bias sleeves and a shelf bra OK? OK.
Did I mention there will be prizes?!!! Our gracious Sponsors are still coming in with more prizes as we speak. The full reveal will be June 1. We hope to see you sewing with us! Subscribe HERE to keep up to date - newsletters go out twice a month with lots of sewing links, recs, and coupons. These are so adorable and so versatile!! You should make one with us!!! You'd be so cuter. What a superb idea! You are very good at sewing. And this beautiful model of proves you are great designer as well! Many thanks for such a good step-by-step explanation. check here for various quilting machines. This is nice post and it may help to many women as this is quite simple and easy to do for those who can use sewing machine with ease. You can check here too. You have sewed very nice and simple dresses and dropped really nice idea, I liked it too much. Thanks for sharing it. See here for more.